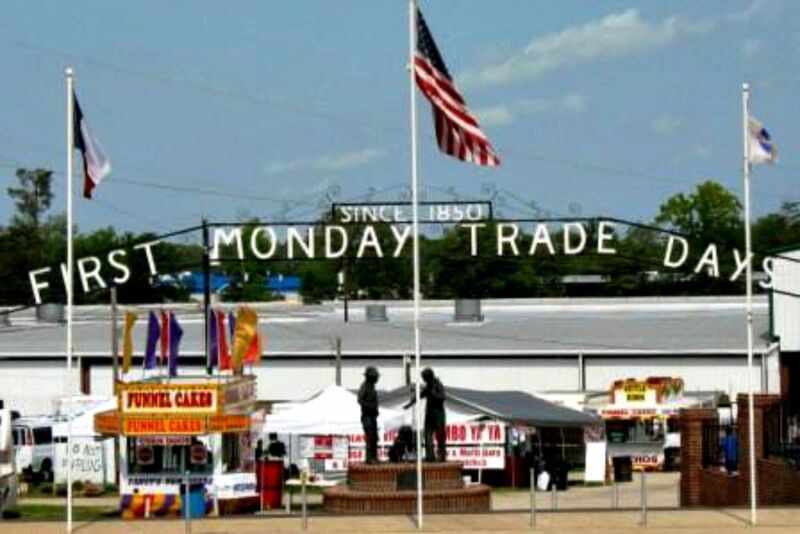 With a 150 year history and more than 28 miles of booths, First Monday Trade Days is the biggest Canton, Texas flea market. In fact, lots of shoppers just call it the Canton Flea Market. Originally a venue to trade horses and livestock, the flea market now sells everything imaginable and hosts hundreds of thousands of shoppers each year. Canton is within easy driving distance of Tyler and Dallas, but shoppers flock from much further away to make a weekend of this huge year-round bargain hunting Mecca. Scooters, shopping carts, and wagons for rent at main entrances. Several ATM machines available within flea market. Picnic areas and lots of concessions available, including funnel cakes, fresh roasted corn, and homemade ice cream. If you buy furniture or other large merchandise, ask the seller for a Gate Pass, which allows you to drive into the flea market grounds for 30 minutes to load purchases. In addition to the vendors selling inside the official First Monday Trade Days Park, lots of nearby property owners are hosting vendors as well. For shoppers, it just adds up to an even larger flea market. Some parking lot to parking lot trolley service is available for shoppers visiting multiple properties. Open-air booth space in the outdoor lots is available to rent at any time during a show. Booth space in the Civic Center, Trade Centers, or the Dry Creek Landing building is available only with an approved advance application. Merchandise types must be approved in advance for the Civic Center, Trade Centers, and Dry Creek Landing. Submit photos with your vendor application for the best results. Only antique and collectible (20 years old) merchandise is permitted for sale in the Civic Center's Indoor Antiques and Collectibles Market. New and reproductions goods are prohibited. All vendors must have a Texas sales tax permit. Electricity and water are available, but extension cords and water hoses are not provided.